Professor Jayashankar Telangana State Agriculture University(Formerly part of Acharya N.G.Ranga Agricultural University) Admission Office, Rajendranagar, Hyderabad issued the admission notification in June/July, 2017 for admission into various courses in its University and affiliated colleges in Telangana State for the Year 2017-2018. The University invited the applications in the prescribed proforma along with required document from the eligible and interested candidates for admission into B.Tsch/Degree courses. Sri Konda Laxman Telangana State Horticultural University for the Academic Year 2017-18. Counselling Schedule - Combined counselling for admission into Bi.P.C. Stream courses of PJTSAU, PVNRTVU & SKLTSHU and Telangana AGRICET-2017 for the academic year 2017-18 from 28th August, 2017 /Counselling schedule for admission into B.V.Sc. A.H., B.Sc.Ag and B.Sc. Hort. Information pertaining to the certification verification and counseling for combined admissions into various UG courses of PJTSAU, PVNRTVU and SKLTSHU. 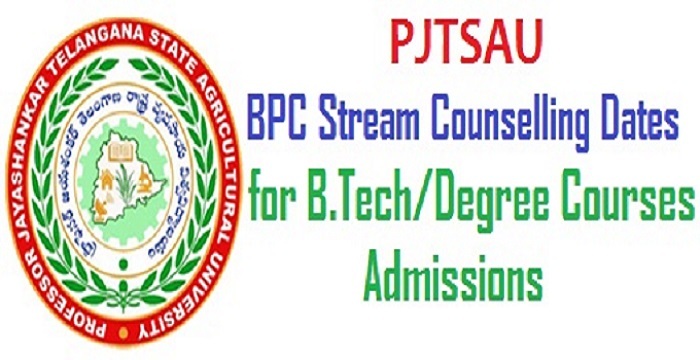 The counselling for combined admission into various UG courses of PJTSAU, PVNRTVU and SKLTSHU under Bi.P.C. Stream i.e. B.V.Sc.&A.H., B.Sc.(Hons.) Agriculture, B.Sc.(Hons.) Horticulture and B.F.Sc., will be held from 28th August, 2017 onwards. The detailed schedule of the counselling along with the Ranks of T-EAMCET 2017 (Bi.P.C. Stream) of the candidates will be placed on the University website on 9th August, 2017. The seats will be allotted in ONLINE mode, hence the candidates need to attend for the original certificate verification for which the dates will be displayed on the University website on 09-08-2017. Hence the candidates are informed to visit website on the said date for detailed information. Combined counselling for admission into under-graduate courses of Professor Jayashankar Telangana State Agricultural University, P.V. Narsimha Rao Telangana Veterinary University and Sri. Konda Laxman Telangana State Horticultural University for the Academic Year 2017-18 viz. B.Sc.(Hons.) Agriculture/ B.Tech. (Food Technology)/B.V.Sc.&A.H./B.F.Sc./B.Sc.(Hons. )Horticulture Courses will be conducted from 03-10-2017 onwards based on Telangana State EAMCET- 2017 Ranks for the candidates who have already applied. Adminissions Counseling of the candidates who have applied for admission into the above courses in these Universities will be based on their Telangana State EAMCET-2017 Ranks on the following dates and time. The counselling for the candidates of Telangana State AGRICET-2017 for admission into B.Sc.(Hons.) Agriculture will be held on ~~~~~~~~~~~~~~~~. Hostel facility for the candidates selected for admission will be provided at the respective colleges subject to availability. The details of the counselling are placed on the websites www.pjtsau.ac.in, www.tsvu.nic.in and www.skltshu.ac.in. Note: Students are advised to check the Official website regularly for the latest guidelines and updated information on notification, courses and application Process. 1. More number of candidates than required are called for counselling and therefore this call does not guarantee admission into courses to all those who have been called for. 2. Open Competition means candidates belonging to OC, BC, SC and ST categories including Non-Farmer and Farmer. 3. On ~~~~~~~~~~~~~~~, the seats under Open Competition only will be filled up on the scheduled days (from 3rd to 5th October, 2017 ) irrespective of categories to which the candidates belong to. 4. Those candidates under reserved categories, who do not secure seat under OC category will have to attend counselling again on respective scheduled dates. 5. The seats reserved for belonging to BC, SC, ST categories including Non-Farmer and Farmer will be filled up on the scheduled dates only. 6. For the Un-Reserved (Non-Local 15%) quota, any candidate from OU, AU and SVU region with Telangana State EAMCET-I 2017 rank can compete on merit basis. 7. In the event of establishment of new colleges, such seats in those colleges will also be considered. 8. The government of Telangana has accorded permission for the establishment of new agriculture college at Warangal with an intake of 60; hence, the intake in B.Sc.(Hons.) Agriculture is 372. 9. The rule of reservation will be followed strictly as specified by the Government of Telangana. 11. Hostel facility for selected candidates at respective colleges will be provided subject to availability. Selection of candidates under SC, ST and BC quota is subject to clearance of the respective social status by the concerned Directorates of Government of Telangana State. The provisional selection under BC-E category is subject to the final adjudication by the Hon'ble High Court of Andhra Pradesh in W.P. No. 15267 of 2007). The counselling for qualified candidates in Telangana AGRICET-2017 for admission into B.Sc.(Hons.) Agriculture will be conducted on ~~~~~~~~~~~. The list of the Ranks (Telangana AGRICET-2017) called for the counselling in respect of Diploma in Agriculture and Seed Technology will be placed in University website www.pjtsau.ac.in. 14. This notification shall be treated as individual intimation and no separate intimation will be sent to the candidates. 15. The Counselling will be conducted on all the days as notified above including public holidays and even in the event of any day being declared a holiday by the government. 16. There is no option for sliding. In the event a seat falls vacant due to non-joining / cancellation of seats, it shall subsequently be filled up again only through open individual counselling. Counselling for admission into various U.G. Courses of PJTSAU, PVNRTVU & SKLTSHU under NCC, Sports, CAP (Defence) and P.H. quota will be held separately and the necessary information will be given separately and the same will be placed in the University website www.pjtsau.ac.in. 19. The availability of seats will be placed in the University's website after the counselling every day. For all the details please visit the University websites of Professor Jayashankar Telangana State Agricultural University (www.pjtsau.ac.in), P.V. Narsimha Rao Telangana Veterinary University (www.tsvu.nic.in) and Sri. Konda Laxman Telangana State Horticultural University (www.skltshu.ac.in).